Enjoy! This apartment is fresh, comfortable, and neatly furnished, and is equipped with air conditioning. 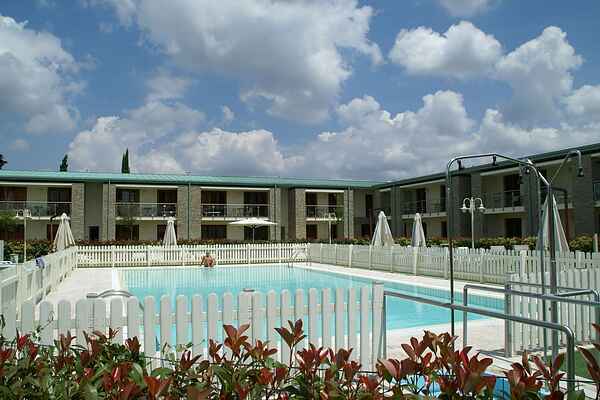 It's part of a spacious holiday park with several facilities. First, take a dive in the shared (fenced) pool, or start by reading a book on one of the lounging chairs. After a day of exploring your surroundings, you can enjoy the culinary offers at the restaurant. Relax on your own terrace. For groceries, the bank and the post office, you can go to Tavarnelle Val di Pesa (3 km). This little village has a central market square. The environment has much to offer. Are you a wine lover? The Chianti region is overflowing with good wines. Looking for sporty activities? An olympic swimming pool and tennis courts are 6 km away, here you can also ride horses. Take a bike ride, or go for a walk in the beautiful hills! Take the car and drive to San Gimignano (20 km), for instance. You'll drive through a breathtaking, typically Tuscan landscape of sloping hills, vineyards and cypresses. Visit Florence (30 km). With its museums and high architecture this city is a beauty to behold.